It’s not every day you get to announce a new world record. But today, Unbounce is proud to announce a completely unofficial, yet totally awesome new IWUR (Integrate With Unbounce Record) set by ActiveCampaign, a cool online email service provider. They wrote a custom Webhook to send leads generated from Unbounce forms directly into their email management software. And they did it in… 89 minutes! On that note, I’d like to send a big #HighFive to ActiveCampaign developer Matt Thommes for putting this together so quickly. If you want to start sending your leads to ActiveCampaign – our knowledge base article has some simple notes and a link to the complete ActiveCampaign instructions. 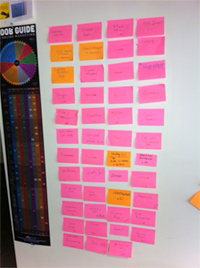 The Unbounce integrations wall - chock full of great companies we want to connect Unbounce to. Want to integrate your company’s product with Unbounce? We are constantly building direct integrations with the companies our customers request most often (see giant integrations wall opposite) – which takes time and resources – and thus a big backlog (note: we are currently hiring more staff for this). In the meantime, we’re actively encouraging companies with a great online product that could play nicely with Unbounce, to try our Webhook to kick things off as quickly as possible. You can check out our Webhook integration guide here. And see if you can do it faster than ActiveCampaign did.